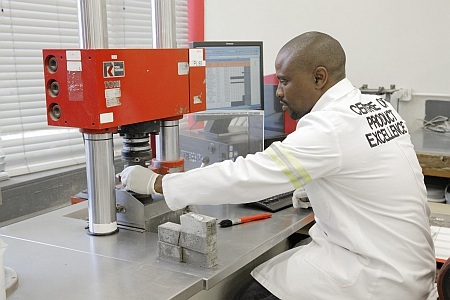 From strength testing and investigating concrete failures to assisting start-ups and developing optimised concrete mix designs and greener cement, Afrisam’s Centre of Product Excellence is a hotspot of construction materials expertise. Since AfriSam’s Centre of Product Excellence started operations in 2012, it proved to be a major driver of innovative cement, aggregate and readymix products and has become a critical point of technical support to South Africa’s construction industry. Consulting engineers, architects and contractors alike rely on the Centre of Product Excellence’s extensive resources to provide invaluable advice on the use and application of AfriSam’s building materials. Mike McDonald, manager of the Centre of Product Excellence, notes that the facility has recorded many milestones since it opened its doors four years ago. One of the most important of these is the valuable role it has played in assisting precast concrete manufacturing start-ups. He explains that the complexities of working with aggregates and admixtures can be daunting in the beginning for many of these fledgling companies. Situated in Roodepoort, Johannesburg, which is also home to the AfriSam state-of-the-art clinker grinding plant, the Centre of Product Excellence creates a hotspot of construction materials expertise. It is home to 15 technical personnel with almost 200 years of combined experience and a SANAS ISO 17025-accredited laboratory. The laboratory is used to test raw materials to optimise concrete mix designs and test products to help customers build better. Last year alone, the Centre of Product Excellence tested 859 external concrete samples, undertook 86 durability tests and crushed more than 13 000 cubes for strength testing, while testing 150 concrete mixes to monitor the performance of other company’s products. This is over and above being put to good use in AfriSam’s own product development programmes. The laboratory is used to undertake physical, chemical and material tests to verify and monitor its own cement products’ quality. Equally important is the role the centre is playing in ensuring the quality of concrete works, by using its thorough understanding of cementitious products to investigate the failure of concrete products. It recently started exporting this aptitude to other countries on the continent, such as Zambia. The Centre of Product Excellence is also focusing on alternative ways of building that challenge conventional brick-and-mortar projects in South Africa, while spearheading ongoing product development into greener concrete mixes and construction practices. For example, the centre continues its work in reducing the CO2 footprint and embodied energy of AfriSam’s products. This includes ongoing studies geared at reducing the clinker content of cement. Last year, the centre undertook 30 comprehensive tests to monitor ash performance in concrete and 90 tests to assess the performance of slag in the material. Ultimately, the team at the Centre of Product Excellence is not only at the forefront of new product innovation, but making sure that AfriSam transfers industry-leading skills to keep its customers at the cutting edge of construction. Caption: Last year alone, the Centre of Product Excellence tested 859 external concrete samples, undertook 86 durability tests and crushed more than 13 000 cubes for strength testing.